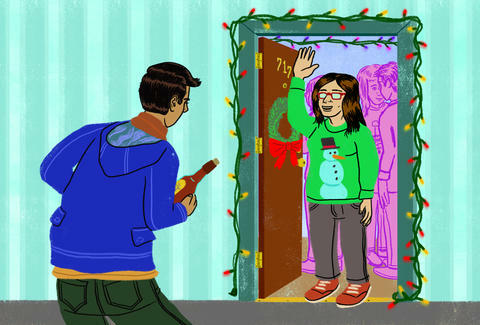 When it comes to party planning in New York, it’s not all eggnog and good cheer. First, there’s the incredibly daunting job of actually figuring out how to fit all those people, the tinsel, and enough food and drink into your 650sqft apartment. While it may seem impossible, the task of throwing a fun party in a small space is actually totally doable. We spoke with event professionals to bring you the most efficient party tips that will make congregating in your living quarters easy, stress-free, and enjoyable for you and your guests. When throwing a party in a small apartment, it’s essential to utilize every square-inch of space that you can. “I’m looking for closet space, I’m looking at stairwells... anywhere there’s a couple feet of space,” says Carla Ruben, president of Creative Edge Parties. If you’ve got a stairwell in your apartment, use it as seating and closet space for people’s bags and jackets. Also be sure to have a designated nook for guests to keep their jackets and belongings in during the party (to avoid them being draped over chairs, the couch, or the bed, which people should be using for sitting and mingling). You can easily pretend your tiny living room fits more than just three people simply by moving small pieces of furniture out of the way or against the wall to make the room appear larger. Ruben notes that even removing a single chair can open up floor space for two people to sit comfortably on throw pillows or cushions in that same space. “Keep the coffee table and move the chairs. Then move the couch against the wall, so you have a big open space in the middle.” Hillary Needle, president of Hillary Needle Events Inc., echoes that sentiment. She notes that keeping just the table in the center of the room makes it a focal point of the party, allowing guests to gather around it and mingle. And for those hosts and hostesses celebrating Christmas, it’s not worth it to take down your tree or move it (as if there’s anywhere to move it to). Ruben says that instead of wasting the space, you’re better off making the tree an interactive part of the party. “Hang things on the tree that have to do with the party.” To get people who may not know each other to interact, she suggests hanging things like fortunes or get-to-know-you questions. You can even hang cookies off the tree, or have your friends and family decorate it at the party. Just because you have a small apartment doesn’t mean you can’t get festive with holiday decorations. Just avoid big and bulky décor, which can take up unnecessary space. “Play with the theme in the invitation, on napkins, on some of the details in the service like the drink stirrer, or put something funny in the bathroom,” says Ruben. This way, you still get to have fun and be playful without taking away space from guests. Needle urges party planners to think vertically when it comes to décor. “Invest in twinkle lights, and hang things from the ceiling.” It’s an easy way to make things feel seasonal without actually intruding on the physical space. Lack of space also leaves little room for dirty silverware and dishes. Ruben says in this case, disposables aren’t necessarily a bad thing. They allow for quick self-service and an easy clean up, which leaves more time to eat, drink, and be merry (and drink some more). When it comes to actually putting out the disposables, Needle suggests that you “display your dishes vertically. Have them up on risers, use a pedestal; a high and low display,” so you can fit more in a small space. Needle also advises hosts to “make small arrangements and put them around the apartment so people aren’t clumped around one food area.” Set separate appetizer platters, chips, and cheeseboards in the hallway, next to the couch, and on a table in the kitchen. To avoid taking up a lot of room with a full bar and giant bottles of soda and liquor, narrow your beverage selection down to wine, beer, and a pre-made cocktail served in a punch bowl. Waste removal may seem trivial, but in a human-packed one-bedroom apartment in New York, garbage can pile up pretty fast, especially after food has been served and a few drinks have been drunk. Designate a close friend to keep an eye on the garbage, at least for the beginning of the night, to avoid a build up and overflow. Risa Hartsough is a freelance writer based in New York who loves dogs more than humans. Follow her on Instagram and Twitter.